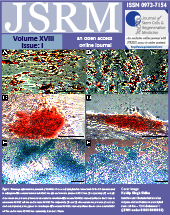 The Journal of Stem cells and Regenerative Medicine (JSRM), an official organ of the German Society for Stem Cell Research (GSZ) is an Open access Online Journal covering areas of Basic Research, Translational work and Clinical studies in the specialty of Stem Cells and Regenerative Medicine including allied specialities such as Biomaterials and Nano technology relevant to the core subject. This Online Journal conceived and run by Clinicians and Scientists, originally started for the student community with reputed members in the advisory/editorial boards, has now been accepted to be the official organ of GSZ is reaching millions of Researchers, Clinicians and Students all over the world. 2. Weekly updates on happenings in the Stem Cell World with email updates to subscribers. German Society for Stem Cell Research to Support the JSRM. Decision taken in the General Body of GSZ on the 3rd Nov 2006, Cologne, Germany.